A single chip 1V/Oct voltage controlled digital oscillator, with 20 waveforms in a scannable wavetable with tons of features: CV’d interpolating waveforms, CV’d subosc waveforms and octaves, CV’d glide, bitcrushing and more! The Frequency CV input accepts 0-5V control voltages, quantized to semitones, to cover the MIDI note range 0-63. It is possible to limit the CV input with the CV attenuator. The basic frequency range of the VCDO is ten octaves from MIDI Note 0 to MIDI Note 120 (8.18Hz to 8372Hz), and can be selected by the manual Frequency knob. The Detune CV input is not quantised, and allows for -5V to +5V CV to modulate +/-8 semitones. The manual Detune knob allows adjustments to be made +/-100 cents. The VCDO section has 16 waveforms which you’re unlikely to have seen before, arranged as a wavetable. 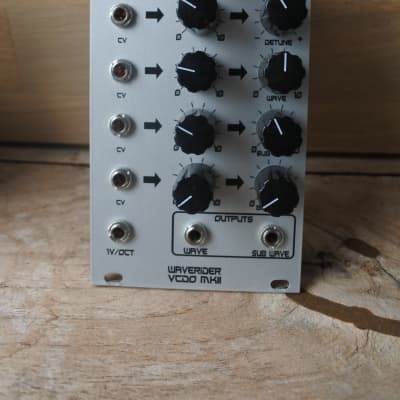 The VCDO is able to crossfade from one to the next, creating a wavetable which you can scan through under voltage control, -5V to +5V. It would have been easy to include standard waveforms like ramps and triangles, but there are many oscillators that produce those. This oscillator has its own character and provides something different. 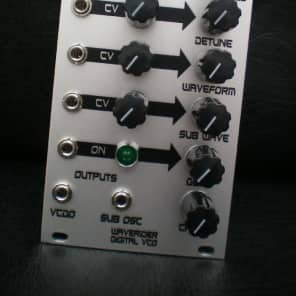 As well as the main oscillator, there is also a sub oscillator with 8 waveforms. Each waveform can be selected at one of four octaves, either +1 octave (above the main osc pitch! ), in unison, -1 octave, or -2 octaves. Additionally, the Sub Wave can be selected externally by CV, -5V to +5V. Waverider also includes a glide/portamento effect, glide times range from 12ms/octave to 2.4secs/octave. Turning the Glide knob to minimum switches the glide effect off. Additionally, Glide can be externally controlled by 0-5V control voltages. The Crush knob controls the sample bit resolution of the output (ie bitcrushing). This can be reduced from 8-bit down to 1-bit in eight steps. The Bitcrush CV input accepts 0-5V control voltages, quantized to 8 values. Outputs 8-bit, 62.5KHz sample output rate. The internal waveforms and calculations are 8-bit, and new samples are output via the on-chip PWM modules at 62.5KHz. The PWM modules’ outputs are at 125KHz.